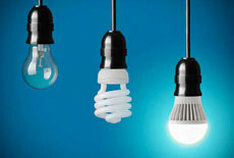 Old style incandescent light bulbs are being replaced by energy saving LED and CFL (compact fluorescent lamps) bulbs. Lights are left on for an average of 3.13 hours per day over the course of a year. With an average of 25 bulbs per household, lighting now accounts for around 15% of the energy bill in most homes (and a significant percentage of CO₂ emissions). Incandescent (average cost £1 each, average lifespan 1,200 hours) Note: no longer available to buy in UK outlets. In an average home using 25 bulbs, if you upgraded five 60W incandescent bulbs to five 15W CFL bulbs, you could save £38 per year = 127kg of CO₂. In an average home using 25 bulbs, if you upgraded five 50W halogen spotlights to five 3.5W LED bulbs (£2.00 each), you could save £29 in year one, then £39.00 per year for many years after that = 130kg of CO₂. It would take 42 old incandescent bulbs to last as long as just ONE new LED bulb, which over its 50,000 hours average life, would save you £405 (at todays electricity prices). 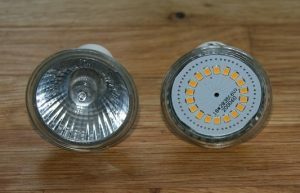 It would take 21 halogen spotlight bulbs to last as long as just ONE LED spotlight bulb, which over its 50,000 hours average life, would save you £262 (at todays electricity prices). If every one of the 25 million homes in the UK replaced just one incandescent light bulb with an LED bulb, it would save £230 million per year, equivalent to 700 million kg of CO₂ (the same annual emissions as released by about 120,000 cars). Note: There was a move in 2014 to phase out incandescent light bulbs, but they are not banned. When purchasing new light bulbs, search for these money saving and environmentally friendly features. Look for the lowest wattage bulbs for the lumen level required. This information will be on the packaging or website. Use LED bulbs wherever possible and start saving money immediately!